With winter temperatures now upon us in the southern hemisphere, most seeds and plants become dormant. We would recommend that you hold your seeds until well into spring giving the ground and soils enough opportunity to increase in temperature best suited for optimum seed germination. With cold soils and even colder water keeping the sand wet, seeds are prone to rot instead of germinating. Please follow our germination instructions for best results. We nick the seed coat edge with nail clippers and soak them in boiling water and almost all swell and are ready with one soaking. Remember that these seedlings and trees hate sitting in water and do not thrive in very soggy soils. Water lightly but regularly. Your climate and soils will determine how much and how often they need watering. Transplant your seedlings once they have their first true leaves and are about 2cm tall into individual potting bags. If your potted trees reach 40cm and have nice pencil-thick stems, but are still tender, wait until early summer before planting them out in your land. Likewise, don’t plant them in late autumn or winter as they may struggle in the frosts and cold. Hold them in a sheltered spot until late spring before planting them in your lands. ← Proof – new germination method is effective! We provide lucerne tree seeds, trees and expertise. Situated on our Klein Karoo farm, Myles & Nadene Esterhuizen farm with lucerne trees (also known as Tagasaste or Boomlusern) since 2008. We sell exceptional quality lucerne seeds worldwide, grow thriving trees and willingly share our years of experience & expertise. This website contains a very comprehensive overview of all aspects of farming with lucerne trees which we share in the hope that we can help others establish this amazing food that grows on trees! Use the contact form on Prices & Orders page for questions, quotes or orders. Enter your email address to follow our blog and receive notifications of all our new posts by email. Food that grows on trees! Lucerne trees are a vertical haystack, a living fodder bale, hardy, quick-growing, fast-recovering, evergreen, nutrient-rich grazing, no danger of bloat, 40+ years of food! To keep delivery costs low, we courier bare-rooted trees with overnight/ express service . Place and order on our Prices & Orders page. 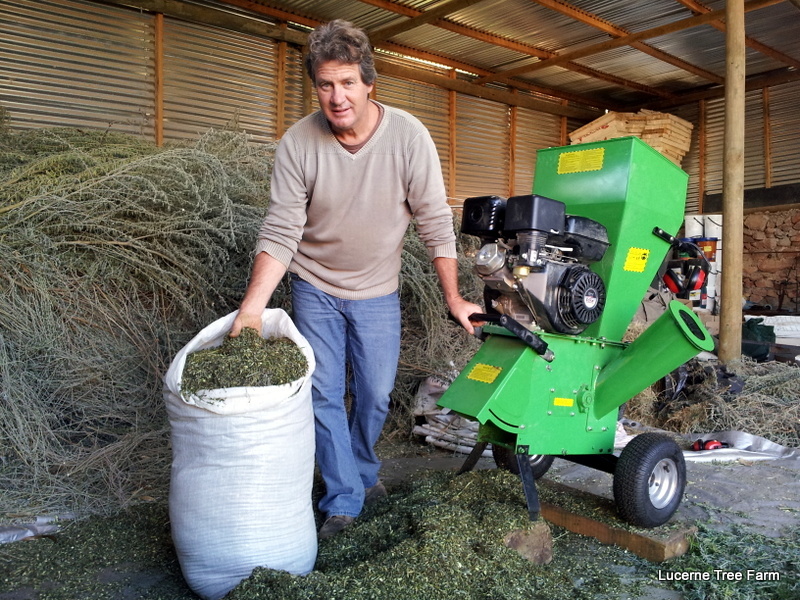 Chipped lucerne tree cuttings form an amazing food, ready to be mixed with other supplements. Fed wet or dried, it is a very nutritious food. We use chipped lucerne trees for our milk cow, for pregnant cows or ewes, or for finishing off animals ready for sale or slaughter. We prune our trees regularly to maintain a 1.5m height. Pruning stimulates thick stem & side branch growth, increasing carrying capacity and enables animals to graze directly off the entire tree. Cuttings are a wonderful food. Ever-green, drought, heat & wind-resistant, nitrogen-fixing, grows for 40+ years = a life-long food-producing investment! We sell our excellent quality seeds in packs of 100s or 1000s, posted worldwide with registered mail, germination instructions and extra seeds are included in seed pack. Contains Bradyrhyzobium sp. (Vigna) bacteria which is a bacterial legume inoculant for effective nitrogen fixation on legumes for clients who wish to add this to their process. All rights reserved. No part of this publication may be reproduced, distributed, or transmitted in any form or by any means, including photocopying, recording, or other electronic or mechanical methods, without the prior written permission of the publisher permitted by copyright law. … or in plain English … do not copy our photos, blog posts, articles and information for your own use without asking us first! Life is in the Seed!